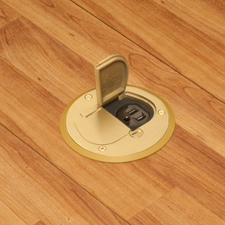 Arlington’s LISTED DROPIN™ Floor Box Kits are the fastest way to install a BOX nearly flush in an EXISTING floor. Designed for flush, neat installations and TIME-SAVINGS these floor boxes install with a SINGLE hole saw and sit just 1/8" off the floor! DROPIN box accommodates most 3.5" standard covers, but Arlington's round low profile covers seat flush into the non-metallic ring, reducing trip hazards. BRASS OR NICKEL-PLATED BRASS Metal Covers have two gasketed flip lids that keep water out and protect the box. DROPIN kits are also available with NON-METALLIC Blank Covers. They're perfect for covering unused receptacles. To use the receptacle simply remove the blank cover. Five decorator colors: dark brown, light almond, gray, caramel, black - each with a matching non-metallic mounting bracket, gasket and carpet ring. Other Products by Arlington Industries, Inc.
Arlington’s Listed IN BOX™ Recessed Cover Kits install receptacles, flush, in a 4.5"concrete floor box. Economical brass- or nickel-plated metal covers have ultra-thin, stamped steel flanges. Recessed covers install in the box, to reduce tripping. Easy installation, there’s a divider for power and low voltage in the same box. Arlington now offers zinc-plated STEEL and STAINLESS STEEL low profile, strain-relief cord grips in addition to its zinc and non-metallic cord grips. These connectors offer the widest cord ranges in the industry, so you’ll have fewer items to stock. And, they deliver superior pullout resistance. Arlington’s low-cost, zinc MC cable fittings save time and money! Arlington’s zinc MC cable fittings, for dry locations, are convenient and cost-effective. They come with easy-to-use end stop bushings that vary the size of the opening; so ONE trade size fits several cable sizes! They not only reduce inventory, but Cost Much Less than steel or malleable iron fittings.